A timer designed to assist your cooking. The simple and clean user interface makes it a delight to use. Features are only added if it is truly helpful, not just because it is possible. 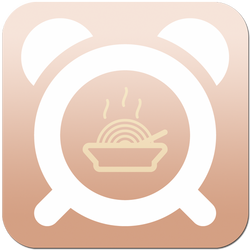 The app will even notify you (via the iOS notification service) at the end of the cooking time even if the app is not currently active. You can even set it to remind you 5 minutes before the end too so you can do whatever preparation you need. Looking for tools for your cooking? Try out our Free AtHomeBaker app - it is designed and written by people who are passionate with their cooking.